Which Islay has taken over. The chair is very 'me' and I love it!! This entry was originally posted at http://ithildin.dreamwidth.org/4003760.html. Please comment here or there. 27 Declarations | What Say You? That IS a gorgeous chair! Wow, that chair is awesome. Thank you for sharing! Like how that cat is sitting there with a very "this chair belongs to me" pose. The chair and the kitty are both beautiful! That is a beautiful chair very unique and eye catching. And the cat is also very striking and beautiful as well. Gorgeous blue eyes - or are they green? Still gorgeous. Like the color of the fur and dark little face, back end and paws. Oh, and I like the chair too. Did it come with the kitty? They're aquamarine. Can never quite capture the colour in a photo. They're quite stunning in RL. That is a magnificent chair and an even more magnificent cat!! Win, win!! And i love your cats name. How did you get the idea for her name? She's one of the Scottish island kitties :) Her sister is Skye, and we also have Lewis and Iona. So you have four cats? And i'm going to visit Iona in may. Nope, have quite a few more than four - but just those ones have the themed names :) I would love to visit Iona! I've visited Skye and Lewis but not Islay or Iona. I never been to Lewis or Isla. I visited Sky and i'm staying a couple of days on Iona. So i can visit the nunnery and the abbey and maybe do a boat trip to Staffa etc. What an awesome chair! And such a lovely, lovely kitty too. She's a looker, that's for sure. Beautiful chair. 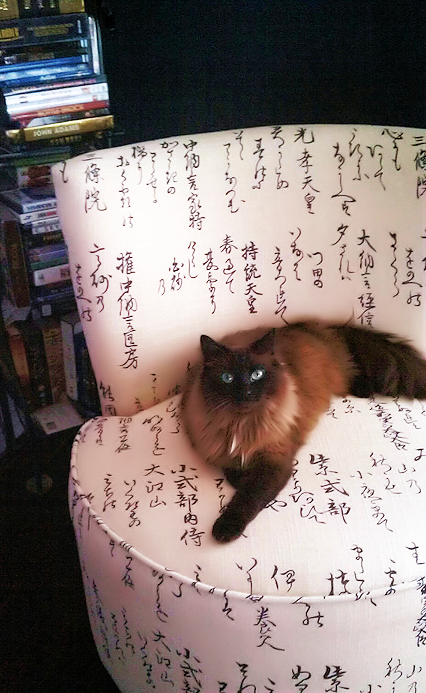 (and beautiful kittah) What does it say? At least it isn't wave equations like something from ThinkGeek, not that that wouldn't be cool too. Since you watch Big Bang Theory, though probably not the reruns on the CW, recently there have been some Chobani ads that feature someone from your area. The Piano Guys provide the cello background music for the ad that starts "only the best", with Steven Sharp Nelson providing the pizzicato and bowing of the cello in the opening notes. I picked up their CD from Amazon a month ago. Now I need to get their Christmas album that is download only. A friend on Twitter says it's names of Japanese Emperors and Empresses, and a poetess.